Food Friday: Tofu-rrific ~ I Can Do That! A friend gave me this recipe which she says she got from her sister's friend's friend. Most probably the recipe is already on somebody's website. This vegan dish is similar to sisig without the pork. It has the perfect balance of saltiness and acidity, is rich and creamy [from the mayonnaise] and mildly spicy [from the green finger chilis]. It is very very very good, it's tofu-rrific. 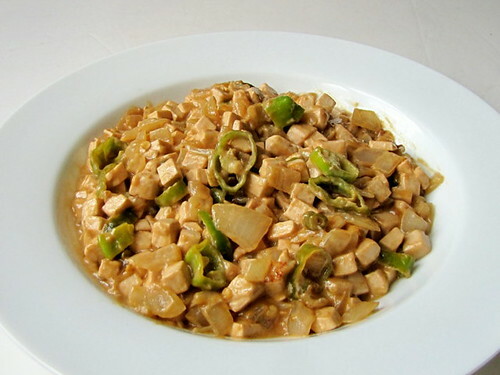 I never thought I'd say this about tofu but yes, this tofu dish is awesome! Heat 3 cups water in a medium sauce pan and add tofu. Leave for 3 minutes then drain well. Heat the oil in a wok or large non-stick skillet. Carefully add the drained tofu, stir fry for 2 minutes. Add onions and stir cook for 3 minutes. Add finger chili, mayonnaise, and lemon juice. Cook for another 3 minutes or until onions are soft. Turn heat off and stir in the soy sauce. Serve immediately. I am more than willing to give this a try... sounds yummy indeed!